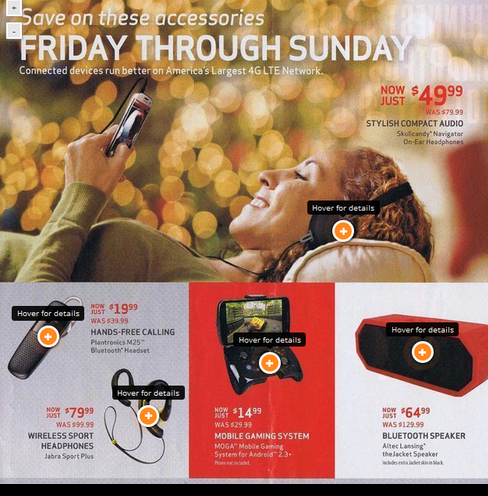 Verizon Black Friday Deals for 2013 Leaked! Verizon Black Friday deals? Oh yes! America’s largest carrier is expected to offer some huge discounts over the year’s biggest shopping season. Verizon Black Friday deals are yet to be officially announced. However, a copy of deals ad has been leaked out showing some very awesome deals that are going to be on offer this year. 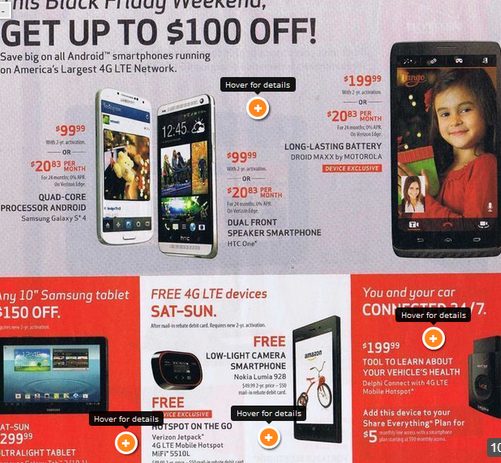 Relevant read: Best iPhone 5s Black Friday Deal on AT&T’s Black Friday Online Sale! You can get a Motorola Droid RAZR HD for FREE this year if you sign up for a two year contract with Verizon. The latest Motorola Droid Ultra will be on offer for only $99 with a 2 year contract. Another Motorola smartphone Driod Maxx will be available for $199 on contract. Verizon Black Friday deal includes a Samsung Galaxy S4 for $99.99 with a signed contract. Another awesome Verizon Black Friday deal? HTC One is also going to be offered by Verizon Black Friday deals for $99.99. Verizon is offering its very own 7 inch Ellipsis brand tablet free with a signed contract. You can avail a discount of $150 on all Samsung Galaxy tablets if you sign a pact with Verizon. 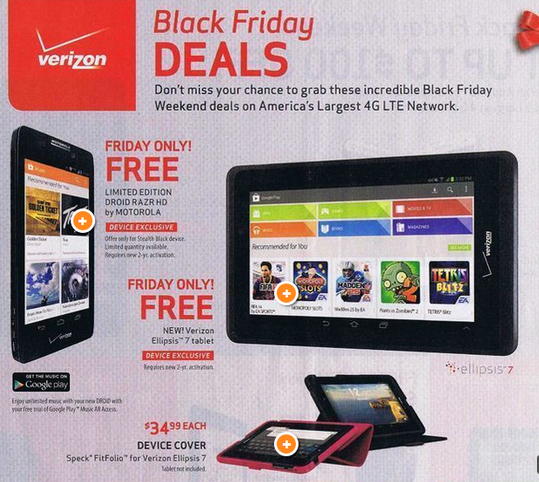 According to the leaked ad, Verizon is also going to offer Samsung Galaxy Tab 2 10.1 on this Black Friday for only $299 with a contract. 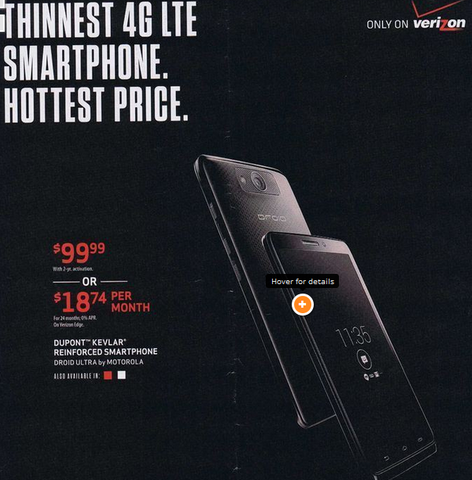 Here are the images leaked about Verizon Black Friday deals. There are some good deals about accessories as well. Check them and start waiting for the official announcement! Relevant read: Black Friday Deals to Avoid on Walmart this Year!